Danny responds to my latest SemWeb rant. I really don't like being boring, but this subject interests me a lot (and I quite like all the rhetorical flourishes) so I'll indulge myself with some further responses. But to be clear, I'm not dissing Danny, I have a lot of respect for what he does both technically and as a SemWeb advocate. But I would suggest that these things are well on their way. ... But the real application is the Semantic Web itself, in the same way that a browser isn't interesting without the web behind it. I'd suggest that they're not well on their way at all, because he misses my point about what a tool "is". A tool is not simply a program that manipulates a data-structure. It's something which solves an existing problem. Something which is the "best tool for the job". Or at least the prefered / preferable solution to the problem. I might be able to open a beer-bottle with a pen-knife, but a pen-knife, however well made, is not a tool for opening beer-bottles. The inner-technology has to, in some sense, match or "afford" the outer usage. The trouble for the SemWeb technologies is that there are almost no problems for which they have any real distinguishing advantages over the SynWeb ones. (This is assuming my distinction between SemWeb, as the place where the meaning of a piece of meta-data is fixed a priori by attaching a URI to it, and the SynWeb as a place where meaning is determined later according to context and convention. As far as I can tell, Danny does still agree with this distinction? Regarding formats without tools, I think you've got a fallacy in suggesting RSS and OPML are somehow special. 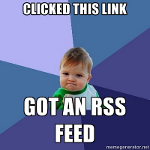 Which came first, the RSS aggregator or RSS? No, I certainly wasn't trying to suggest RSS and OPML are special. They're interesting only in the sense that they are succesful examples of the SynWeb, and what you could call the "Winer" strategy. Heh, your choice of the word "parasitic" is a bit ironic, because you could say the OPML Editor and RSS apps are parasitic on the web, and the Semantic Web is an extension of the web. The Semantic Web isn't an extension of this at all. It's basically a naive assumption about how meaning works ("hey! if we all use the same code-numbers for things then we'll know when we're talking about the same stuff") and a crowd of enthusiasts engaged in the Sisyphan task of trying to make anything useful from this assumption; while, all the while, casting covetous glances at the meta-data which is being generated by people who aren't burdened with the responsibility of inventing common code-numbers and ontologies. Final point on what I meant by "tools trump formats / processes" because both Danny and Scribe have picked up on it. I'm not saying you can do without common formats. Of course a format is absolutely essential. What I'm saying is that the "goodness" of the tools is more important than the "goodness" of the format for the adoption and survival of the combined pair. Because it's the tools which are the interface to the outside world : the users. I'm arguing with Danny Ayers again. My latest take on tools vs. formats. Getting data out of OPML and RSS 2.0 is SynWeb rather than SemWeb, because the decision as to what the information "means" is decided by the scrapers (following usage conventions) rather than by explicit URIs added by the data's creators. Tools trump formats and processes. The funny thing is not simply that this is *true*, but that the entire history of computer science can be interpretted as one long war between pragmatic tool builders and idealistic format / process builders. And the tools win every time. And the idealists *still* haven't noticed. A format without a tool is like a technology without a business model. It has no interface to the wider, user, consumer community. It is not ecologically "fit". It can't feed itself on user attention or money but must be kept on life-support by optimists. The SemWeb people are great programmers. They spend all their time writing code. How come they never actually produce any "tools"? Because all the tools they produce are explained like this : "this is a great tool because it uses a better format / process". That's not a "tool" or an "application". Because tools / applications have an inner-world of their technology, and an outer-world of their usage. And they have a story that mediates between the two. That explains *why* this technology is necessary for that usage. SebWeb programs have an inner-technology *and* an outer usage. But they have no story that joins the two together. A story that says "this technology is *also* for that usage, but better (by some internal criteria)" isn't the same thing. This is why they must be parasitic on the story provided by real tools like the OPML Editor and various RSS generators, consumers. This criminal "economy," which I call the bazaar, is an economic platform that connects transnational crime with local global guerrillas. ZDNet : Writely = Microsoft's Pearl Harbor? Here's another kind of platform war. There's a story going around the net that Iran is starting an oil bourse, where people can trade oil in Euros instead of dollars. Read here for the geopolitical effects, including some of the theories of how this influences the current US build up of rhetoric against Iran; and here for some fairly good criticism. I'm not sure which of these positions is more plausible, but what I am convinced by is that the petrodollar ecosystem is as much a platform as the Windows or iPod ecosystems are. And that, there could be a platform war fought between it and a petroeuro platform, and if so, generic platform war strategies would apply.